The fast food giant's CMO, Deborah Wahl, discussed this summer's creative review and the brand's ambitious marketing plans at Advertising Week. 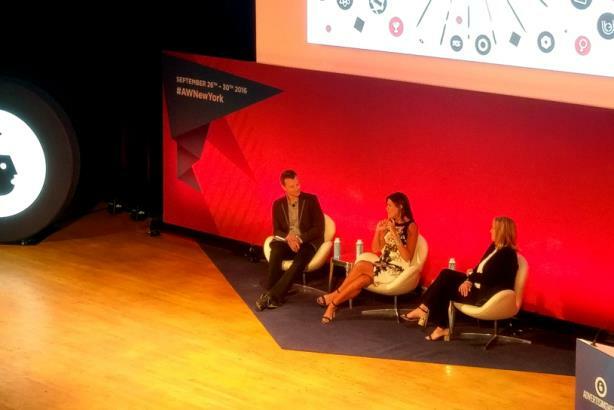 McDonald's CMO Deborah Wahl at Advertising Week New York. (Photo credit: I-Hsien Sherwood, Campaign US). NEW YORK: Older McDonald's fans will remember the red-and-gold signs outside the restaurants that boasted how many billions of burgers the chain had sold. Though the brand retired the signs in 1994 after hitting 99 billion burgers, one could imagine a modern version that counts how many billions of consumers the brand interacts with on social media, judging by the remarks of CMO Deborah Wahl on Monday. The fast-food giant hears from one of its customers every two seconds on average, said Wahl. "Right now we’re able to respond once every 10 seconds. We’d like to be able to respond to all of them." Less than a month after handing Omnicom and DDB the entirety of the McDonald’s U.S. account, Wahl discussed details of the winning pitch and some of the partnership’s strategy, in a conversation with DDB NA CEO Wendy Clark. The pair spoke at Advertising Week New York on Monday at The Town Hall Theatre in Manhattan. Wahl refrained from specifically mentioning Publicis Group, the losing competitor in the two-way pitch, except to call "all the agencies" that participated in the review "fantastic." Instead, she focused on the features of the DDB pitch that won her over. "The way we need to engage with customers is changing dramatically," she said. She cited the sheer volume of work required by the chain. In 2015, agencies produced 2,500 pieces of work for McDonald’s. But they’ve already produced 5,000 in 2016 so far. A desire to streamline the process led to the agency consolidation, Wahl said. Traditionally, agencies competed over bits of the McDonald’s account – one might have the kids’ menu, while another might create work for sandwiches. With increased consumer engagement happening outside of traditional channels – like on social media or mobile devices – McDonald’s took a close look at "how we tell a cohesive story across all those channels," and decided it needed to work with a single agency for all its needs. "It was a dream brief," Clark said of the RFP that dropped in her lap April 25. McDonald’s needed creatively excellent work produced on a short timeline in a cost-effective way. "Good, fast, cheap," she said. "That agreement was very clear in the RFP." Wahl stressed that McDonald’s was looking for an agency that could take the mountain of data generated by the company’s customer interactions and consumer insights and create an effective strategy for the volume of work. "Customers are fearless," she said, so knowing how and when to interact with them is crucial. That means only engaging in conversations where the brand can actually offer "something material," Clark responded. "Brands need to remember they’re uninvited guests. What will you contribute that gets you invited? Throwing your body across the top 10 trending hashtags is not a strategy for social media." In addition to social listening, which both women praised for unearthing the desire for the wildly popular all-day breakfast, Clark posited that the right kinds of data interpretation can lead to proactive discoveries, too – "cultural foresight" that she said could predict trends even before they emerge on social media.